A neurosurgeon from Stanford, and a movement disorder specialist from Parkinson’s Institute discuss deep brain stimulation. The purpose of the yesterday’s presentation at the Parkinson’s Institute was “to take mystery away from the question, “Am I the right candidate for Deep Brain Stimulation (DBS)?” The featured speakers were Dr. Rohit Dhall, MD, MSPH, Director of Clinical Services at Parkinson’s Institute and Dr. Jaimie Henderson, John and Jene Blume-Robert and Ruth Halperin Professor of Neurosurgery, at Stanford’s Movement Disorders Neurosurgery. In this presentation, Dr. Dhall reviewed the selection process for DBS, and Dr. Henderson focused on the surgical procedure. A moment in Dr. Henderson’s presentation not to be missed is when he plays an audio of the neural sounds of movement that come from tremor and sound like “bacon frying.” It is miraculous to hear the sounds of neurons ‘talking” as the body moves! Dr. Dhall was formerly Medical Director of Neuromodulation at the Barrow Neurological Institute where he evaluated PD patients for appropriateness of DBS surgery, supported functional surgeons, and provided post-implantation care. Dr. Henderson is an expert in the surgical treatment of movement disorders and chronic pain, and is active in research and development of improved DBS surgical techniques. In 1994, while on the faculty at St. Louis University, he started their Movement Disorders Surgery Program. In 2001 he joined the Neurosurgery staff at the Cleveland Clinic, in Cleveland, Ohio, where he spent 3 years developing innovative surgical techniques for deep brain stimulator placement. He began working at Stanford in 2004. 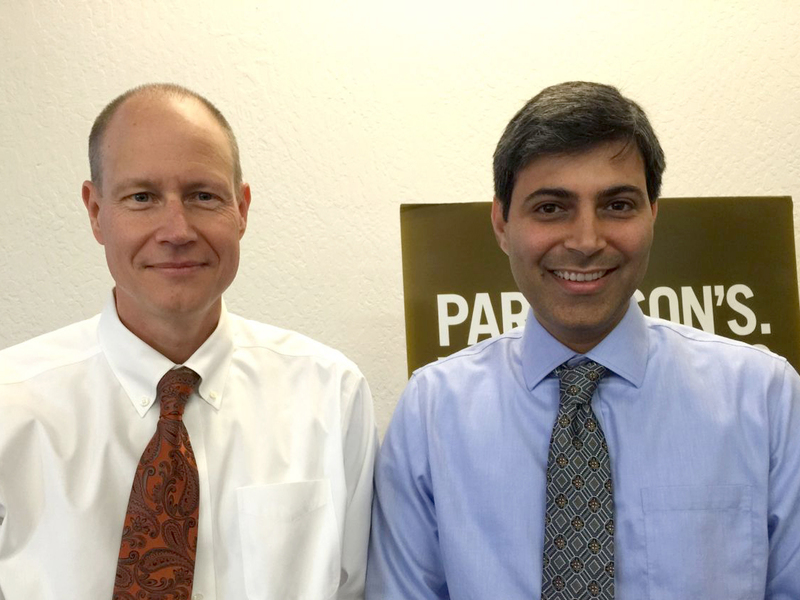 Details about Dr. Henderson’s surgical procedure can be found in an article I wrote about Dr. Henderson titled Dr. Jaimie Henderson, Stanford Neurosurgeon Speaks at PI when he made a presentation on Deep Brain Stimulation at the Parkinson’s Institute in 2014. There are always new facts to learn about DBS, and this occasion was a opportunity to hear a discussion by two doctors. For those of you making a decision about having DBS, consider attending a presentation. You’ll learn a lot about the complex treatment and procedures, and maybe you’ll get to hear a tremor talk!